Sometimes one day isn’t quite enough time to explore Milford Sound, especially if you’re wanting to enhance your time by experiencing one of the walks in the region or go scuba diving. Stay the night and discover the sound under the tranquil southern night sky. Because of its location within a national park, and a UNESCO World Heritage Site, freedom camping at Milford Sound is strictly forbidden. There is only one public accommodation provider in Milford Sound, called Milford Sound Lodge. The lodge has a range of options to suit all budgets. Nestled beneath the towering peaks of the Darran Mountains, Milford Sound Lodge provides a fantastic base to experience the beauty and majesty of Fiordland National Park/Te Wahipounamu – South West New Zealand World Heritage Area. Milford Sound is an essential part of any New Zealand holiday. Whether you are chasing adventure sports, or sightseeing by car, Milford Sound Lodge can help you get the most out of your time in Fiordland. Milford Sound Lodge welcomes travellers of all kinds, with accommodation options ranging from tent and caravan sites to shared dorms, cabins and lodges and their award-winning luxury riverside chalets. Another Milford Sound accommodation option is to stay overnight on the fiord with an overnight cruise. If you’re walking the Milford Track, you’ll need to book accommodation in the huts along the route. 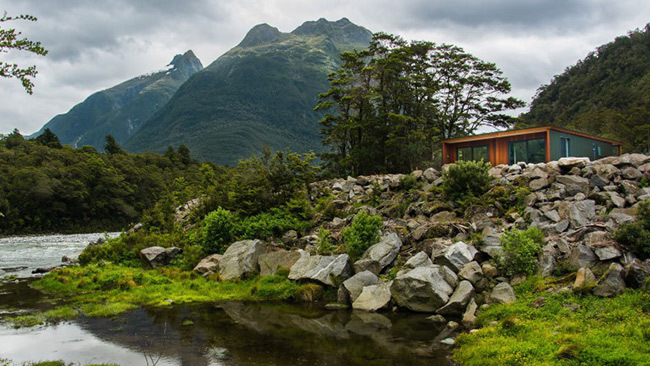 You can learn about how to book huts on the Milford Track (or other walks in the Fiordland National Park area) on the DOC website. Queenstown and Te Anau are popular starting points for Milford Sound day tours. Both towns have a wide range of accommodation available, from hostels and campsites to B&Bs and hotels. Many Milford Sound day tours offer complimentary hotel pickup and dropoff from selected accommodation providers. There is also a campground at Knobs Flat on the Milford Road. Search for Queenstown or Te Anau accommodation now and get the best rates, guaranteed.